Whether it's thanks to environmental cues, a keen sense of smell or a nifty magnetic instinct, Pacific salmon's ability to navigate back to their home streams has captivated scientists and the general public alike. But, contrary to popular notions, a small number of Pacific salmon stray from their predetermined paths every year. And now, a new study found that hatchery salmon that wander from their home stream could pose an additional danger to their wild counterparts. Scientists have long warned that hatchery strays compete with wild fish for resources in streams and ocean waters, and could threaten wild populations by mixing genetically with them in unfavorable ways. The new findings suggest hatchery strays pose an additional threat: Their presence in some streams contributes to low-oxygen conditions that culminate in die-offs before they can reproduce. The study, published in the journal Ecosphere, focused on Indian River and Sawmill Creek in Southeast Alaska — a region where the seafood industry generates almost $1 billion in wealth annually. Researchers found that large numbers of hatchery salmon strayed into wild streams where, combined with low water levels, they caused what scientists call hypoxia — a critical shortage of dissolved oxygen. As salmon make their way back to their home rivers, they need cold water with high oxygen for basic functions, including spawning. Slow, languid rivers tend to have less oxygen than waters crashing over rocks and falls, a process that injects oxygen back into the river. Large numbers of fish and low water flows can add up to a perfect storm: When fish use up oxygen faster than it can be replaced, they can suffocate and die. The authors predict that the problem will worsen as climate change reduces winter snowfall and summer rainfall in the region and low flows become more common. "If we always had high flow, this probably would never be a problem. In our case, it was a combination of low flow and salmon density that led to hypoxia," said Chris Sergeant, an ecologist with the National Park Service and lead author of the study. Sergeant also pointed out that the low dissolved oxygen conditions were recorded in relatively cold water, contradicting notions that this is a warm-water-only problem (cold water can hold more oxygen than warm water). Such conditions can result in hundreds to thousands of dead fish and other vertebrates, events known as fish kills. Another study published this year found that overcrowding and low flow in a Southwest Alaska creek also led to less-than-optimal dissolved oxygen levels — and the deaths of thousands of female sockeye salmon before they could spawn. 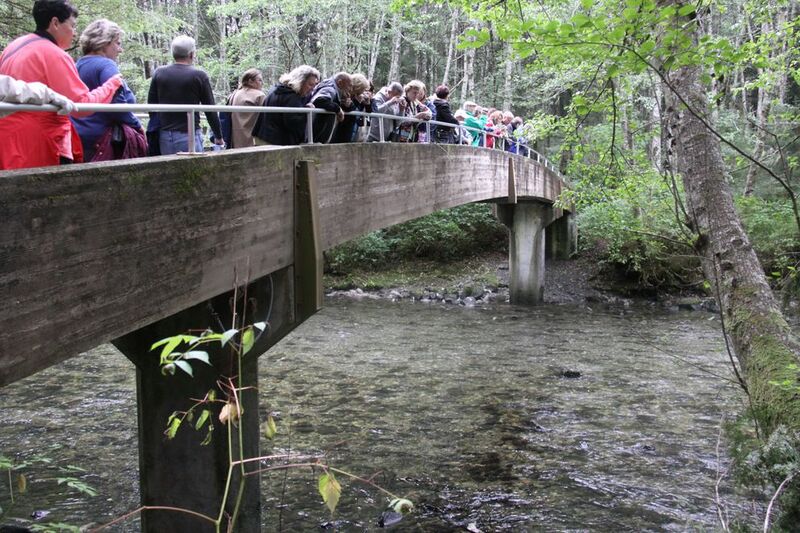 Sections of the creek with the lowest dissolved oxygen levels saw the highest proportion of death, ranging from 46 to 90 percent of salmon dying before spawning. In the Indian River, researchers found that from 2013 to 2015, up to 62 percent of sampled pink salmon carcasses were strays from the nearby Sheldon Jackson Salmon Hatchery. In Sawmill Creek, 51 percent of chum salmon returning to the creek to spawn from June to August 2015 were strays from other hatcheries. Significant numbers of straying fish have been recorded elsewhere, such as in a 2012 study of streams in Prince William Sound: On average, that study found, hatchery pink salmon comprised 12 percent, 18 percent and 21 percent of the waterways in 2008, 2009 and 2010, respectively (and individual streams saw much higher percentages). Multiple studies outside Alaska have shown that genetic mixing can lead to decreased fitness of wild populations. Due in part to these studies, Alaska has required hatcheries to use stock only from local sources, which theoretically should minimize the loss of fitness in wild fish observed in other parts of the world. But such measures wouldn't protect against the crowding that starves a river of oxygen at low water levels. Straying is a natural aspect of Pacific salmon biology, Peter Westley, assistant professor at University of Alaska Fairbanks, said. It's all part of a biological impulse salmon have to hedge their bets in case a catastrophic event hits the home river — a straying relative can ensure the continuance of the genetic line if all others are wiped out. These strays only comprise a small amount of the total number of Pacific salmon that return to freshwater streams each year. But due to the high number of salmon that hatcheries release, this low percentage of straying fish can quickly add up. Hatchery operators forecast around 67 million hatchery fish will return from the sea this year. Fish and Game does not have an official policy dictating acceptable levels of hatchery strays in wild streams, but the Prince William Sound Comprehensive Salmon Management Plan, written by Fish and Game staff, sets a guideline of 2 percent. "Even if (hatchery salmon) stray at a small percentage, you have a large number of hatchery fish getting into wild populations," Westley said. "This can lead to a large amount of strays intermingled with wild fish." 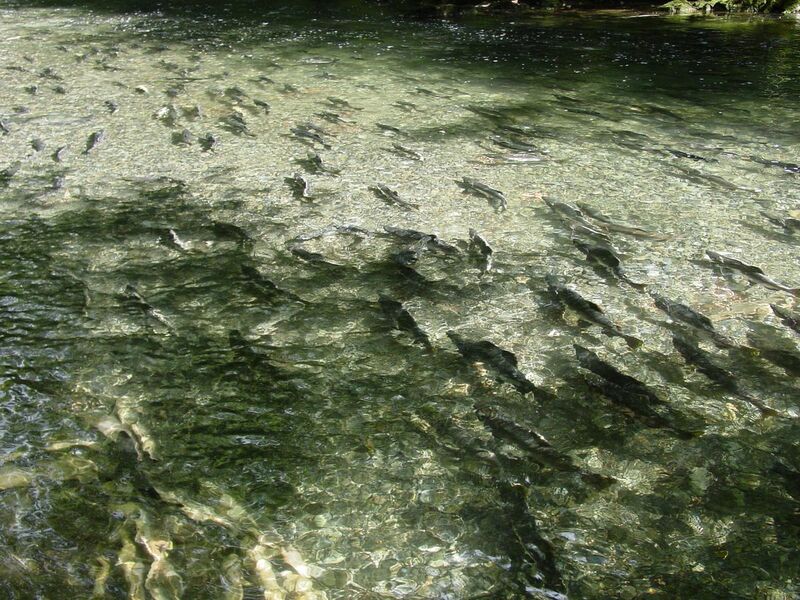 Streams close to hatchery-salmon release sites were found to be the most inundated by straying hatchery fish. But one study of straying hatchery salmon in Prince William Sound found that some streams more than 20 miles from a hatchery-release site had more than 50 percent of hatchery pink salmon in their ranks. To reduce the number of hatchery strays in wild streams, Westley said hatcheries could reduce the number of fish being released into the wild. "You would think that option would be on the table or up for discussion," Westley said. "It is not. Today, the trend is going towards larger numbers of hatchery releases rather than smaller numbers." The reason for this is mostly economic — in 2016, Alaska's commercial salmon hatchery catch was estimated to be valued at $85 million. More research may be necessary to determine how broadly the results of the Indian River-Sawmill Creek study can apply to other Alaska streams. Mark Stopha, who coordinates hatcheries for Fish and Game — and who in 2015 wrote an evaluation of the Sheldon Jackson Salmon Hatchery and its compliance with state regulations — said other factors are likely to have contributed to hypoxic conditions. Both of the Southeast waterways have seen "significant" impacts from man-made alterations, including gravel extraction in the Indian River, water diversion and such natural impacts as improved salmon survival rates. "If you remove gravel from a stream, put in a dam or divert water, fewer salmon can inhabit the space, regardless of their origin," Stopha wrote in an email. "And in some cases, the only fish you will find there could be hatchery strays (if there is a hatchery nearby) or natural strays. And those fish, while they died from hypoxia, would not have successfully spawned anyway because the system was altered." Sam Rabung, aquaculture section chief for Fish and Game, also pointed to human factors that complicate the study. Because some of Indian River's water is diverted, and the mouth of the river and the fish ladder leading into the hatchery are close to each other, the waterway and the hatchery are "essentially the same." For Rabung, the real concern learned from the study is the extent that global warming will negatively affect stream flows and water temperature, both of which affect oxygen levels in the water. And both men point out that wild and hatchery pink and coho salmon stocks have intermingled in the Indian River since the 1970s. "It is unclear to the author why there is concern for hatchery strays to the spawning population in the Indian River when the river and hatchery populations have been managed as a single stock since the 1970s," Stopha said in his 2015 report. The question of hatchery salmon straying and their effect on wild salmon populations in Alaska has placed researchers from universities, Fish and Game and hatcheries at odds with each other. "I think it's fair to say that there is a consensus that excessive strays from hatcheries to wild populations are an issue," said Milo Adkison, professor at UAF. "But there are differences on what is 'excessive.' "
Is it 2 percent, like the Fish and Game guideline, or something higher, like the 12-18 percent averages seen in Prince William Sound? Others say that there isn't even a consensus that Alaska hatchery strays are a problem within wild populations. "A lot of people are against hatcheries, and rightfully so, because of how they are run in other places around the world," Rabung, said, referencing the practice of some hatcheries to not use local stock in their hatcheries. "Here, it's not like that." What the different sides agree on is that there is a need for more research on the topic, especially in Alaska. Currently, researchers are monitoring Prince William Sound and evaluating the effect of hatchery strays on wild populations in the region. The multimillion-dollar project started in 2012 and will run to 2024. "This is a tricky issue that's just coming into light. We're just now getting the data to say why it's happening," Sergeant said. And even then, the way that data is read could be colored by which side is speaking. "Whether you say straying is an issue or not is coming from your perspective of what it's going to do to your system," Stopha said. "I don't think that fishermen think that it's a problem. I don't think operators and the economy think that it's a problem." Kelsey Lindsey is a 2017 graduate of the Columbia University Graduate School of Journalism and is covering Arctic-related issues as part of an Alaska Dispatch News-Columbia fellowship.